If you missed that post, click HERE to get ideas on exercise, meals, and cute work out gear (spoiler alert: you must get some of these pants)! At the bottom of the post, I also share my entire weight loss journey from a couple of years ago and you’ll get to see how much weight I lost each week! LOFT is 40% OFF right now, and his is what I ordered yesterday…just click on what you are interested in! I won’t keep it all, but I’m excited to try it all and pick my favorites! BACK IN STOCK!!! BACK IN STOCK!!! BACK IN STOCK!!! I always hate it when I highlight an item for y’all, and then it sells out immediately. I feel like such a tease :), and I feel terrible when you have your hearts set on an item that is no longer available. Well, there are several items I’ve talked about in the past that are now BACK! IN! STOCK! 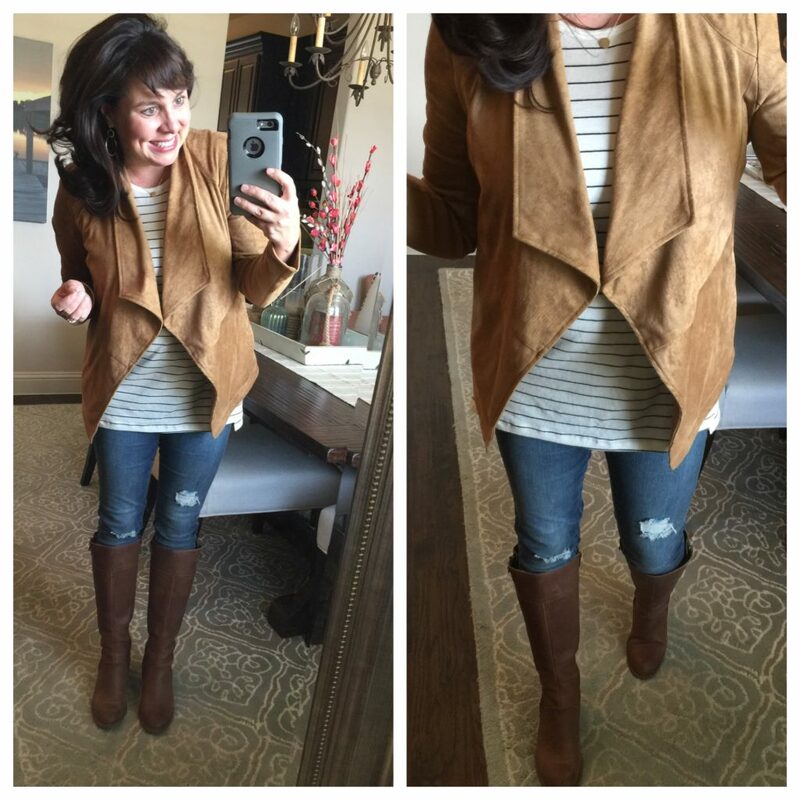 First up, this waterfall suede jacket! I fell in love with it a couple of months ago, but I only showed it once because it felt unfair to keep sharing it when y’all couldn’t get it! WELL, IT’S BACK BABY! The suede drape front jacket doesn’t feel like a jacket at all. It feels like a buttery layer that is soft, stretchy, and keeps you warm. But it’s definitely jacket-like. Jacket-ish if you will. All you really need to know is that it’s awesome. As you can see, the tee is longer than a regular t-shirt and looks great out. You can also do a half tuck. For size reference, I’m wearing a small in the tee, a medium in the jacket, and a 27 in the jeans. The blardigan sweater is back too! And now they have it in black!!!! I LOVE the front pocket, I LOVE the thumb holes, and I OF COURSE LOVE that it’s blardigan fabric. Things are just so soft when they are woven by angels. ???? (It’s 75% nylon and 25% rayon just like the original blardigan, the baby blardigan, and the hooded blardigan). For size reference, I sized up to a medium for a little room. Now, if I had designed it myself, I would have changed two things: I would prefer the neck to be smaller and for the length to be a bit longer. Those two things would just up the cozy factor. Still, I’m keeping the sweater. 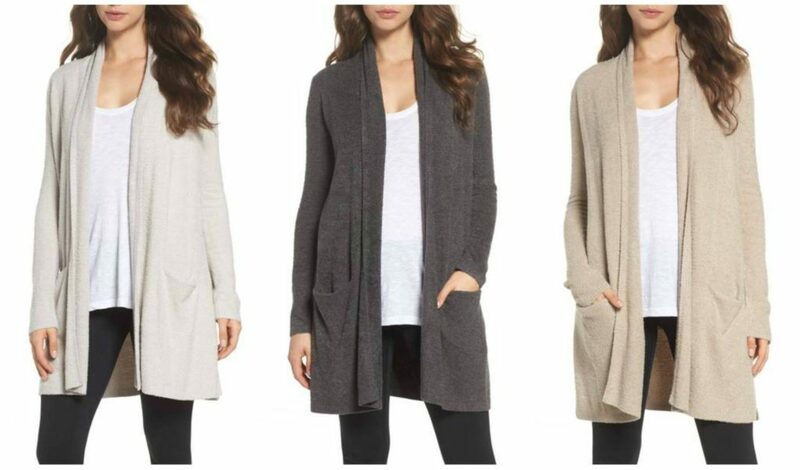 Speaking of blardigans, this cardi is back and STILL ON SALE! It looks very similar to the hooded blardigan, but it doesn’t actually have a hood. It’s 33% OFF, and as y’all know, Barefoot Dreams items rarely go on sale! 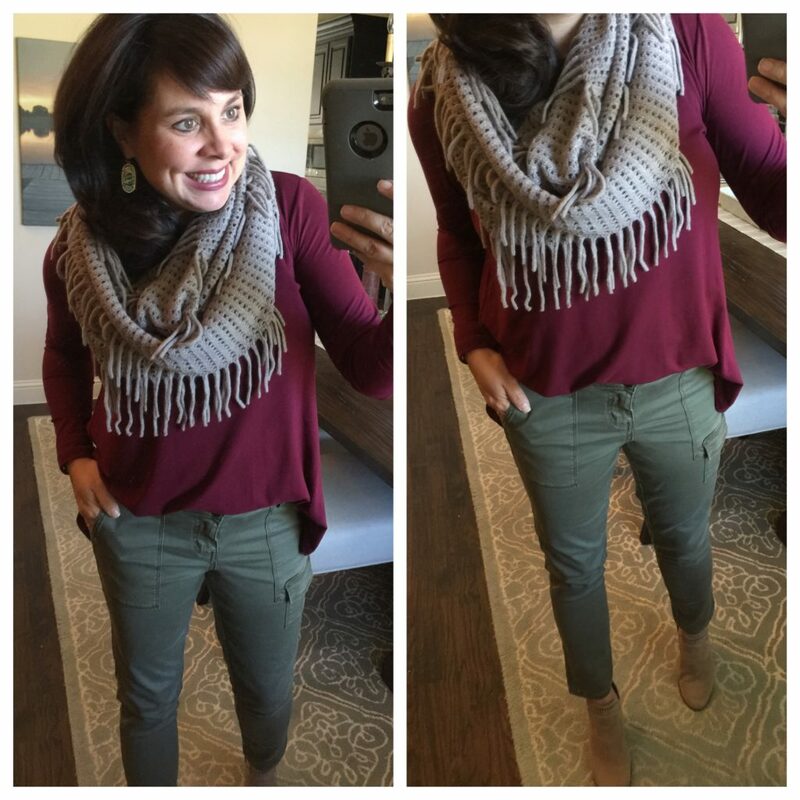 The last BACK IN STOCK alert today is for these skinny cargo pants! I’m wearing them here with my “like buttah” tee! For size reference: I’m wearing a small in the tee and a 27P in the pants (I’m almost 5’4″). As part of my Ambassadorship with Sole Society, each month I will be highlighting items from their new lines! Last month I fell in love with these mules (the least mule-ish mules I’ve ever seen! ), and I’m sooooo excited about today’s new items! This month I chose these booties and this small cross body bag. 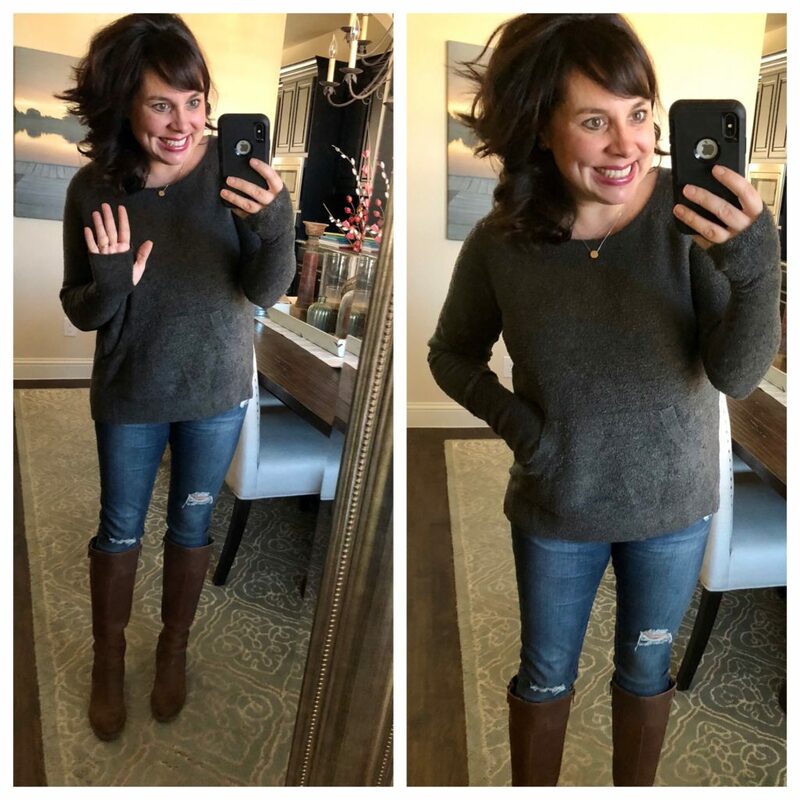 Last week I showed you an outfit I was planning with my red twist front sweater, and today I’ve got the outfit to show you! 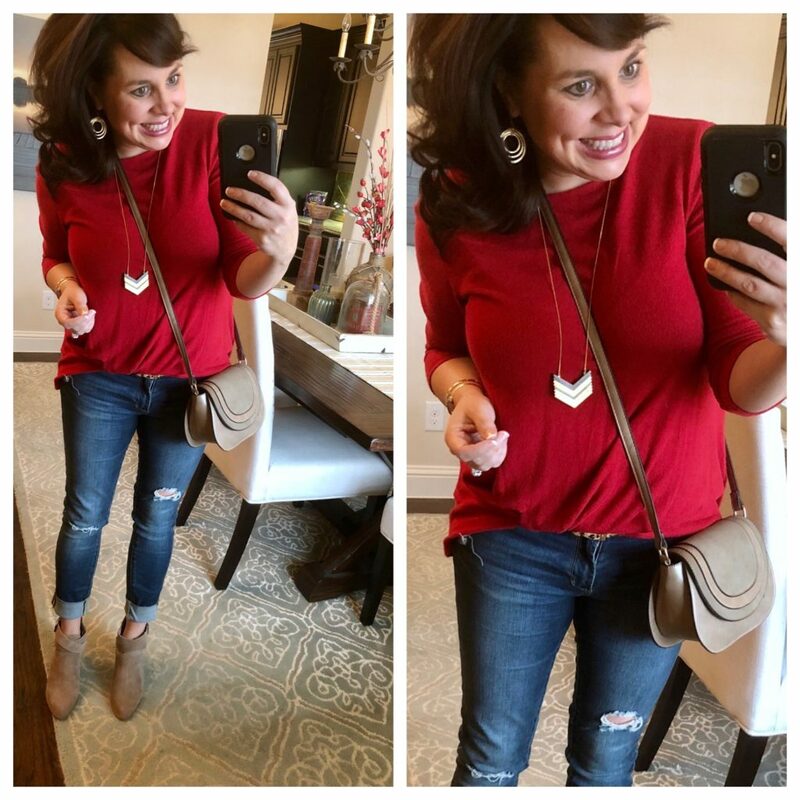 The booties have sassy cut outs on them, and the small size of this crossbody is what I’m seeing everywhere! It’s smaller than I would typically carry, but I thought it was lots of fun! Here are two more outfits I’ve planned to show you the versatility of the boots and bag. All I’ve done in the next two pictures is just change out the top. Everything else in the outfit is the same! 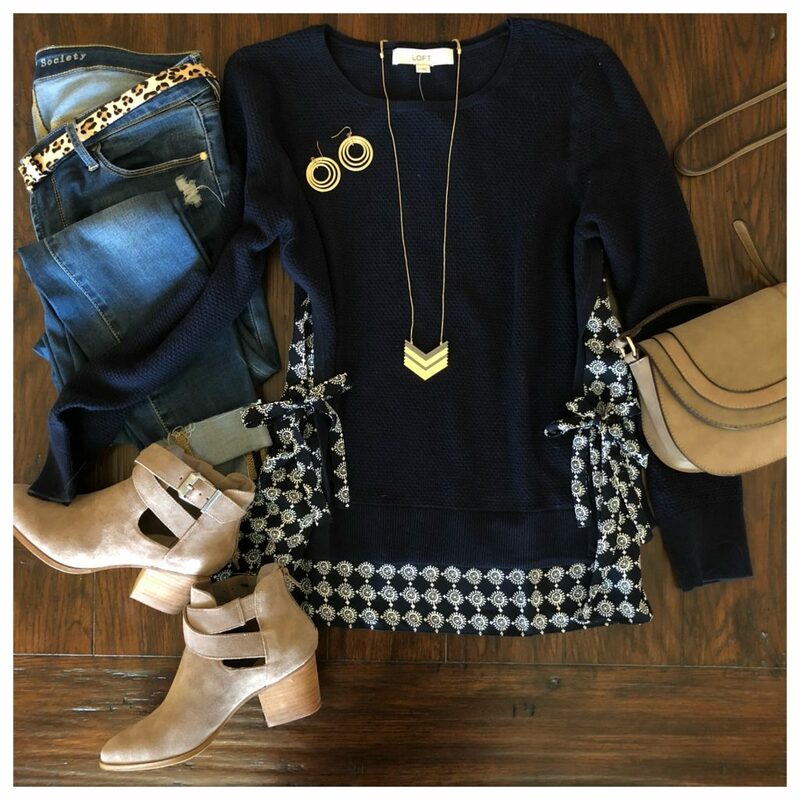 The darling sweater is 40% OFF right now. I love the layered look and the side ties! And I don’t think you can ever go wrong in stripes and a cardi. For size reference, I wear a medium in the tee (I sized up), a small in the cardi, and a 27 in the jeans (both true to size). 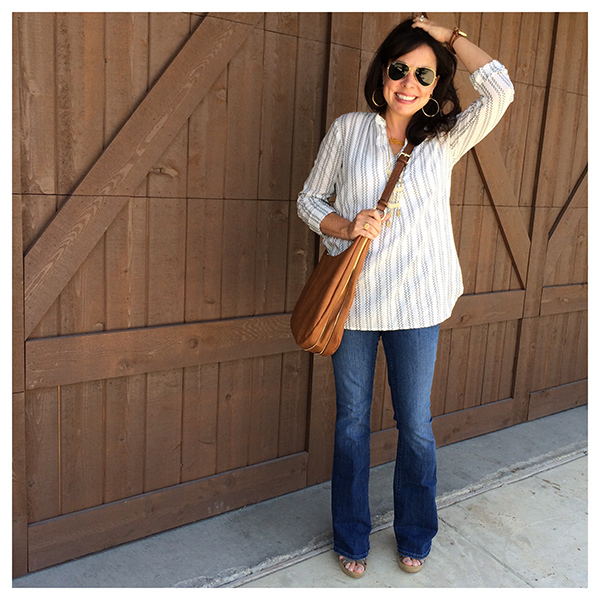 The classic striped tee is one of the favorite items in my closet, and I’ve had so much fun wearing the long grey cardi! AND IT’S ON SALE! 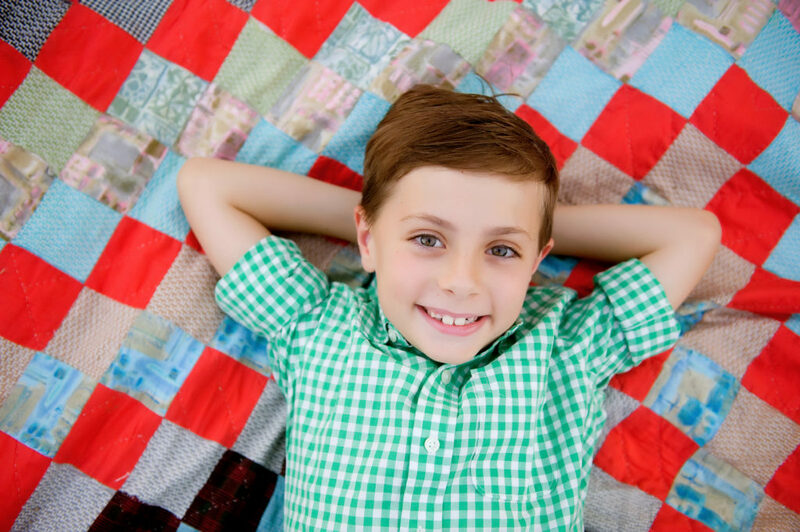 Thank you to Sole Society for sponsoring this portion of the post! I think I showed you a couple of these pictures back in the summer when we had them done….and I know you saw the family picture when I posted our Christmas card….but I wanted to have them all in the same place! 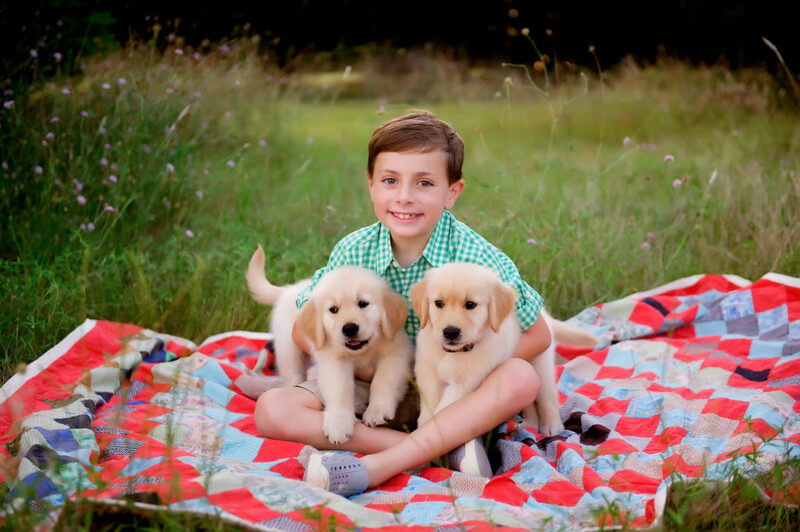 I had asked Narci to take pictures of Carter and the pups the week we got them. Well, about an hour before meeting Narci, I decided to hop in the shower and throw on some make up…you know, just in case I decided to jump in one. And then about 5 minutes before we were supposed to leave, Chris noticed that I was doing my hair and make up, so he threw on a polo and ran a brush through his hair. AND Y’ALL! LOOK AT THE FINISHED PRODUCT. I’m so happy we have these as a reminder of such a precious time in our lives! Thank you for the pictures, Narci! I will always treasure them! And last, but not least…If you missed my Bachelor recap, click HERE! Even if you don’t watch the show you should check it out! I have sooooooo many readers that say they don’t watch the show, but they still enjoy the recaps! I mean, even if you don’t watch, you need to find out what’s going on here…. I hope everybody has a wonderful weekend with their friends and family! 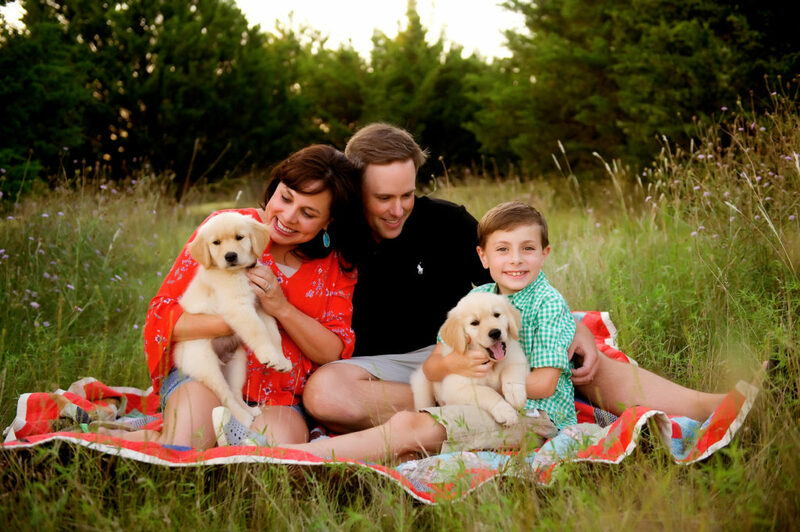 Sheaffer those family pictures are PERFECTION!!! I’m so glad you did them!! They are all just so sweet!! Those pictures are my favorite too!! I’m so glad you guys hopped in a couple. And I’m caught up on the Bachelor and ready for your post next week! Wahoo!! 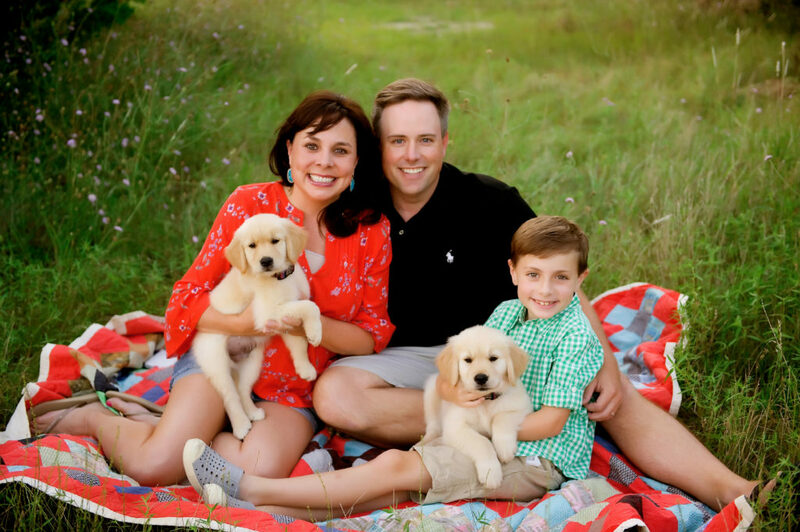 Sheaffer – Great post and wonderful family photos! I have a question about the twist tie fleece top. You posted in an earlier blog that you wore a size S but, on the Nordstrom website, it says to order one size down. I think you and I are the same size. Should I disregard their comment? How does the small fit you? Thanks so much. Aw, you guys are so precious! You should totally jump in the pictures every year!! Love you guys! And, your Bachelor recaps are the best and so funny!! My favorite read on Wednesday mornings!! Thanks for the Blardigan update. I ordered another one in Sand. I gave my daughter a Blardigan for her Birthday a couple weeks ago and she texted me yesterday the below comment. She is a Blardigan convert also. Have a great weekend!! I love the family pics, they are darling! Love the photos! Gosh, those puppies grew fast! What size did you get in the Loft side tie sweater? Awesome, I usually wear the same size as you do, which makes ordering so easy! That cute sweater has been ordered! Thanks, Sheaffer! Have a great weekend! 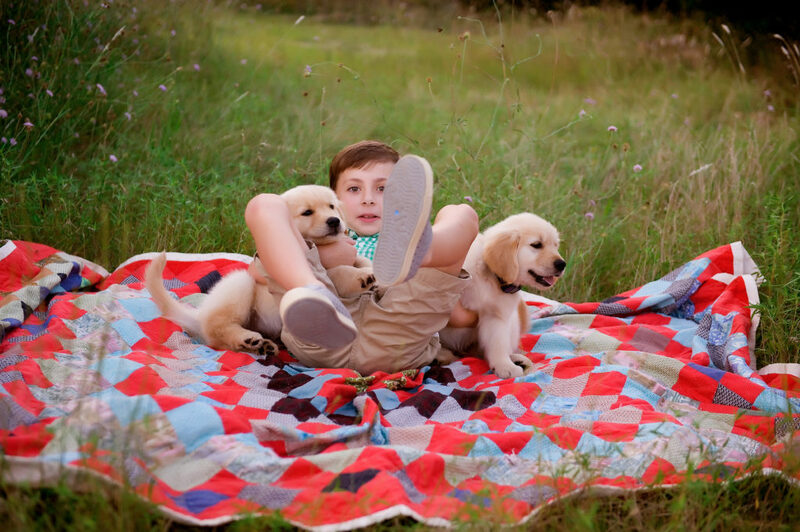 Love your family pictures with the puppies! Love your family pictures! Such a beautiful family! I love your family pictures! They look like they came right out of a magazine. 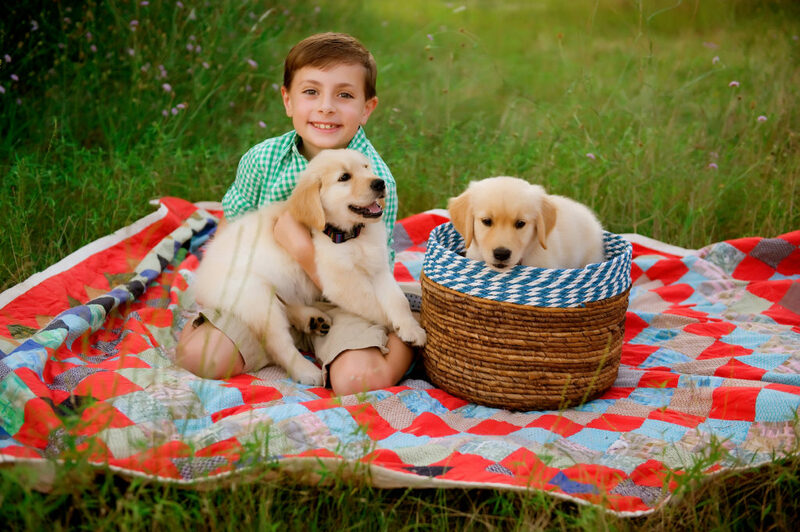 Your family pictures are so good, I love the casual, relaxed, outdoor setting with the puppies! I gifted myself a blardigan for Xmas 2016 (bought during the Nordstrom sale) and am pretty sure I wore it every single day in 2017! In fact I have it on right now, it is freezing cold in Houston this morning. Gifted both of my daughters blardigans and they love them too! Thanks for always letting us know about such great deals!